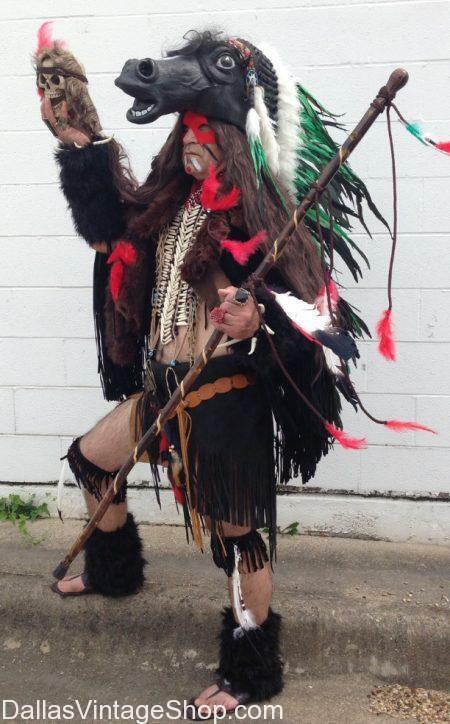 For Convincing Old West American Indian Costumes like this Running Horse Shahmen, we have the best. This Extravagant American Indian Shaman Outfit is one example of the kind of details we offer for Old West Famous or Historical Figures. If you need Historical Old West Character Attire, Fantasy, Cosplay, Burning Man, Old West Movie Characters, Old West Frontiersmen, Mystical or other Old West Characters of any kind, we have everything you need from head to toe. Get Supreme Old West Garb or Median and Economy Priced Costumes and Accessories. We have the largest selection in the Dallas, DFW or North Texas Area and we are open all year round.